Orrin Grant Hatch was born in Pennsylvania to Jesse and Helen Hatch on March 22, 1934. His great-grandfather, Jeremiah Hatch, founded Vernal, Utah. Senator Hatch married Elaine Hansen of Newton, Utah, in 1957 and they are the parents of six children, twenty-three grandchildren and ten great-grandchildren. Hatch is a member of The Church of Jesus Christ of Latter-day Saints. He served as a full-time missionary in the Great Lakes States Mission, which covered most of Indiana, Michigan and Ohio. Hatch has served in various positions in the LDS Church including stake high councilman and bishop. As a young man, Senator Hatch learned the trade of metal lathing from his father and put himself through Brigham Young University as a card-carrying member of the AFL-CIO. He graduated in 1959 with a degree in history and was awarded a full honors scholarship to the University of Pittsburgh Law School. To provide for his growing family, Hatch put himself through law school working as a janitor, a metal lather and as an all-night desk attendant in a dormitory. In 1962, he received his Juris Doctorate, graduating with honors. He practiced law in Pennsylvania and Utah before his election to the United States Senate in 1976. Since then, Senator Hatch has received six honorary doctorate degrees from law schools and universities. Hatch defeated three-term incumbent Democrat Frank E. Moss with the fervent belief that he could make a difference in Washington. His campaign was based on conservative principles of limited government, tax restraint, and integrity in public service. 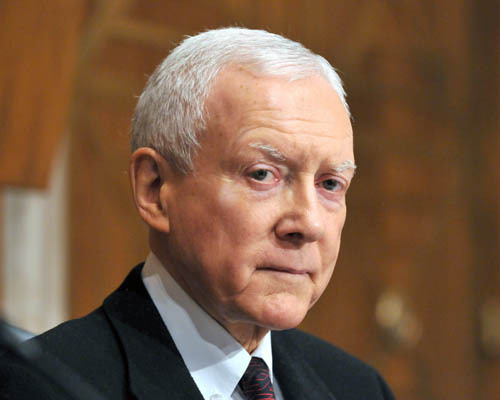 As Utah’s Senator, Hatch has fought against expanding federal bureaucracy and costly federal regulations. He has been recognized by the National Taxpayers’ Union for his fiscal responsibility and has been dubbed by others as “Mr. Free Enterprise,” “Guardian of Small Business,” and “Mr. Constitution.” He also has been honored with prestigious Tax Fighter Award for his votes to reduce spending, cut taxes and shrink the size of government. In 2009, U.S. News & World Report magazine and the Harvard Center for Public Leadership named Senator Hatch as one of America’s top twenty-two leaders. 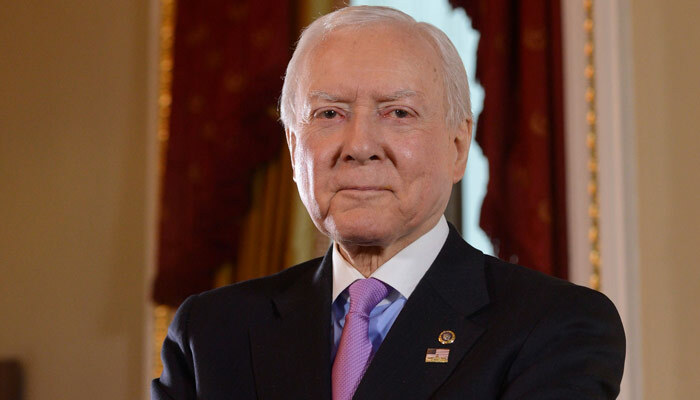 Senator Hatch plays the piano, violin, and organ and also is known for lyric writing. He co-authored “Everything and More,” sung by Billy Gilman and is recognized as a patriotic and LDS music recording artist. Hatch and Janice Kapp Perry co-wrote the song “Heal Our Land,” which was performed at George W. Bush’s January 2005 inauguration. In addition, he appeared as himself in Steven Soderbergh’s Oscar-winning drama Traffic, in a brief cameo in a scene set during a Washington D.C. cocktail party. Soderbergh later featured one of Hatch’s songs, Souls along the Way, in his film Ocean’s 12 as background music for a scene in Utah. Hatch has also authored, or co-authored several books, including his most recent, An American, a Mormon and a Christian. Now in his sixth term, he is the Ranking Republican on the Senate Committee on Finance, the committee responsible for overseeing 60 percent of the federal budget including Medicare, Medicaid, and Social Security, as well as all tax policy and international trade agreements. As the most senior Republican member and former Chairman of the Senate Judiciary Committee, Senator Hatch takes an active role in the confirmation of all judicial nominations, including justices of the Supreme Court, and has a direct impact on such issues as civil rights, immigration, antitrust and consumer protection, and issues related to the Constitution. Among his many achievements and initiatives are the balanced budget amendment to the Constitution, the Strengthening Our Commitment to Legal Immigration and American’s Security Act, the Religious Freedom Restoration Act, the Americans with Disabilities Act, the Omnibus Property Rights Act, the Antiterrorism and Effective Death Penalty Act, the Comprehensive Methamphetamine Control Act, the Dietary Supplements Health and Education Act, FDA reform, the Orphan Drug Act, the Ryan White AIDS Care legislation, the Job Training Partnership Act, the Utah School Trust Lands Exchange Act, and the Radiation Exposure Compensation Act (RECA) for Utah down-winders (who were affected by radiation from nuclear tests). Senator Hatch is a member of the Senate Health, Education, Labor, and Pensions Committee, Senate Select Committee on Intelligence, and the Joint Committee on Taxation. He also serves on the Board of Directors for the Holocaust Memorial Museum in Washington, D.C.